This June is the 10-year anniversary of the far-and-away most traumatic end-of-year party of my life. 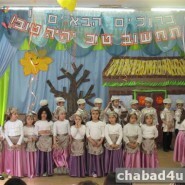 In 2005, Hallel was graduating from kindergarten at Gan Rafaela. It had been a tough year for Rafaela, Hallel’s teacher, whose dedication to the girls and great skill as an educator seemed, to me, to go largely unnoticed by the parents. The cultural and linguistic divide between Israeli Rafaela and the mostly American parents had turned out to be just too wide to bridge. I arrived at the party on time (in other words, half an hour early) and I sat for a few minutes with two other mothers. As we chatted, it dawned on me that nobody had collected money for a present for Ganenet Rafaela and her assistant Chaya. I thought of the tense relationship between Rafaela and many of the mothers, and I realized that the lack of a present would be a devastating insult to Rafaela, whom I respected and liked so much. When I pointed this out to them, the mothers I was sitting with urged me to run out to buy a present… so I ran out to a drug store on the corner and bought 2 gift packages of moisturizers and soaps and ran back to the gan. But by the time I got back, the party had already started. And then I saw her…My Hallel was standing alongside the other girls, and crying. Even today, 10 years later, it is hard for me to write about it. To remember the pain I caused her. And the awfulness didn’t stop there. It took me years to forgive those mothers. But it took me even longer to forgive myself for what I had done. Truth is, maybe I never really have? After the party, I apologized to Hallel for what had happened, and explained to her why I had run out like that. But the experience was so painful that I never mentioned what had happened at the party to her ever again, even though I thought about it frequently for long afterwards. Yesterday, I was getting ready to take Tsofia to her end-of-year party, and Hallel, who finished 9th grade last Thursday, was brushing Tsofia’s hair. “I remember my end-of-year party at Gan Rafaela so well!” Hallel said. Ten years had passed, but it didn’t matter. As I heard her say those words, my heart clenched up. Hallel continued: “I remember how excited I was that you and Rabbanit Yemima Mizrachi spoke in front of all the girls and mothers and gave those soaps to Ganenet Rafaela and Ganenet Chaya!” Hallel recalled with a big smile. What? I didn’t even remember that…But then that long-forgotten memory returned to me past all those years of regret. In my mind’s eye I saw how Rabbanit Yemima, who was also a mother at the gan, and I blessed the teachers and handed them the presents I had bought. And that is something, I hope, I will be able to remember at upsetting parenting moments in the future…and maybe you will too? Last week, I had a similar experience. I extended myself for my son & then missed picking up my daughter as I had told her I would. I felt so guilty especially since she wasn’t feeling well. We try our best, right? Thanks for the chizuk, Chana Jenny! Yes, Devorah, we try our best – and Chana Jenny – I can relate to this. Chana Jenny – what I took from this, was in fact, your daughter remembered the important thing, which was the values you taught her of kindness, respect, and appreciation , in this case, of her teacher. This is the part she remembered, not the being late, so in fact, what you did was so right, which was teaching her values by example. She obviously did pick this up, because this what she remembered! May she continue to grow with the same middot you have! you made me smile! thank you for pointing this out to me! !